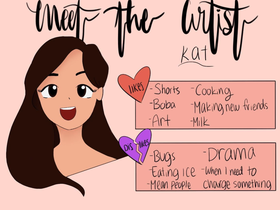 Hi, I’m Kat! I like drawing, coding, reading, food, and looking at other artists' work. This account is mainly to post drawings I do for fun. If you are interested in an AR, please order from me at the Elements Cafe!